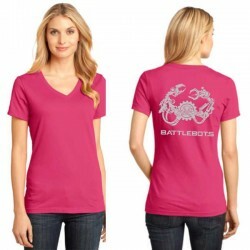 Lead your team into battle with this great T-Shirt (available in pink, purple, royal blue and charcoal)Specifications:District Made - Ladies Perfect Weight Crew Tee4.3-ounce, 100% ring spun combed cottonColor: PinkSize Chart..
Lead your team into battle with this great T-Shirt (available in pink, purple, royal blue and charcoal)Specifications:District Made - Ladies Perfect Weight Crew Tee4.3-ounce, 100% ring spun combed cottonColor: PurpleSize Char..
Lead your team into battle with this great T-Shirt (available in pink, purple, royal blue and charcoal)Specifications:District Made - Ladies Perfect Weight Crew Tee4.3-ounce, 100% ring spun combed cottonColor: Royal BlueSize ..
Show the bots some love with these great V-necked T-shirts featuring the original BattleBots logo. 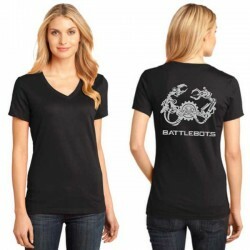 Limited availability.Specifications:District Made - Ladies Perfect Weight V-Neck 4.3-ounce, 100% ring spun combed cotton Co.. 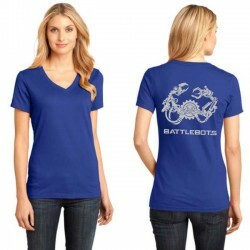 The original Season 2 design features images of all the competing bots. Available only in Light Steel.Specifications:Hanes Nano - Light Steel4.5-ounce ring spun cotton* *please note that this color is a 90/10 cotton/poly blen.. 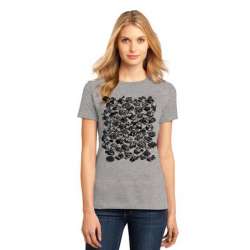 Specifications:District Made - Ladies Perfect Weight Crew Tee4.3-ounce, 100% ring spun combed cotton Color: Black Size Chart ..